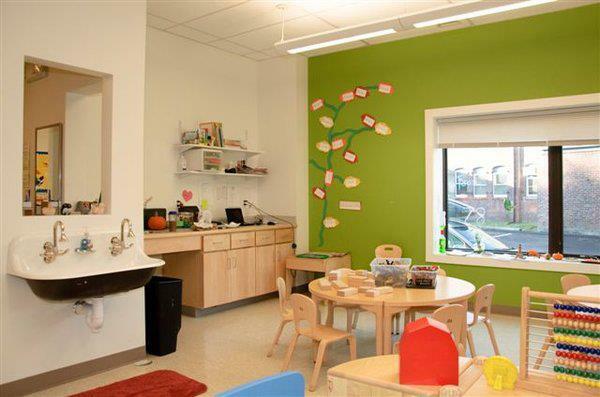 Located at 44 Park Street, Somerville, MA, Bigelow's state of the art facility—conveniently located between Harvard, Porter and Union Squares—is designed with children in mind: It features five classrooms—including a new infant room—as well as an indoor gross motor space, a library, a dedicated playground and community garden. Bigelow’s contemporary home was designed first and foremost to be a child-centered environment. There is substantial research on the importance of the physical environment on children’s social, emotional and cognitive development. A child’s physical setting provides numerous learning opportunities. For a child who primarily experiences their environment through their developing senses, everything is to be touched, smelled, manipulated to make sound, and carefully examined. Our space was designed to facilitate such ad hoc educational moments. Our facility was also designed with our community learning model in mind. 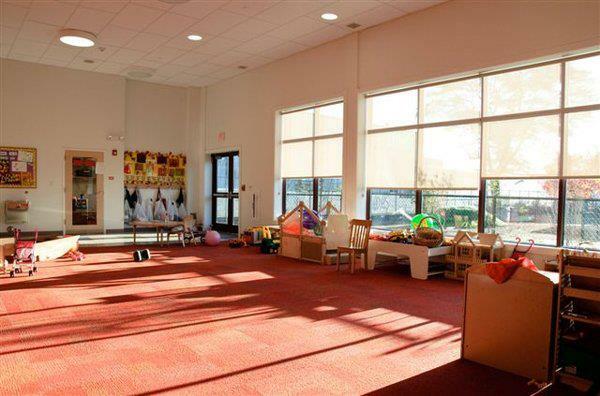 Our indoor gross motor space, awash in natural light, features high-ceilings, bold colors, soft-surfaced flooring, and low window sills that offer views to the playground, parent parking lot and train tracks to children of all ages. It is central to all classrooms, and is adjacent to the staff offices, kitchen, and library creating a vibrant ”town-center” for our community throughout the day. It also directly connects to our dedicated playground, extending our communal space outside our walls. At least once a month, the gross motor space morphs into the Community Room, where we gather after school for communal meetings, pot-luck dinners, concerts, fundraisers and other shared activities. Each classroom has an abundance of natural light, warm colors and constantly rotating displays of the children’s ever-evolving artwork. The classrooms have distinct color palettes that give them their own identities, but each was designed to allow the teachers to engage the children in a multitude of emerging individual and group learning and play activities. In and out of the classrooms we have numerous display areas that allow the teachers to document our children’s learning throughout the school. Without uttering a word, visitors to Bigelow are aware of our values by what we put on our walls. Our facility was designed to meet current building and energy codes, as well as highly-specific regulations pertaining strictly to childcare centers. Motion-controlled lighting, efficient heating and cooling equipment, and highly insulated floor, wall and roof assemblies greatly reduce our energy consumption. Bigelow’s indoor air environment is constantly exhausted to provide new filtered outdoor air at all times. When heating or cooling of that new fresh air is called for, it is delivered low to the floor, to the benefit of our little ones.